The #Occitan #Wikipedia uses Wikidata to populate information in many stub articles. There are several Wikipedias that use information in this way. Running a bot that reads "political party" information from the English Wikipedia will enrich all of them slowly but surely. This does not add any value to the English Wikipedia. When you want them to adopt the information from Wikidata, there has to be a strategy that will demonstrate the added value of Wikidata. The most obvious method is to run a bot on another Wikipedia that collects "political party" information. As this adds information lacking in the English Wikipedia, it makes a strong point for using this information from Wikidata. Somewhere in the future a tipping point will be reached. This happens when people from multiple communities start updating their information in Wikidata. This tipping point will be different for each project. Arguably the projects that have little data of their own will be the first to reach this point. Their first challenge is to add labels in their language for all the items they use. There are two ways of helping this process on the way; adding information by bot or by hand. 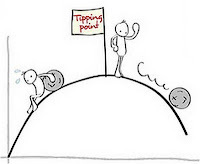 Reaching these tipping points will happen but it will take a lot of hands to make it happen sooner and not later.